Over the next 3 years, the automation rates of French logistics depots could catch up with those observed in their German counterparts. On the condition of adopting new technology as of today. Stéphane Conjard, Director of Knapp France. With growth of 6.5% and €3.7 billion of cumulative turnover forecast for 2016 according to the French association of equipment manufacturers for construction, infrastructure, steel and handling equipment industries (CISMA), the French intralogistics market is in excellent health. In the first quarter, productive investment rose by 1.6 points (+7% expected this year). As a result, manufacturers of handling machinery are seeing the orders start to pile up. Furthermore, while exports of capital goods are slightly down (-1.3%), Germany still appears to be a fan of products from its Gallic neighbour (+5%). French buyers, too, have confirmed the upturn with a renewed appetite for automated systems (those capable of replacing human labour either partly or entirely for specific tasks). This is a relatively new phenomenon: in the area of automation, the country traditionally lags behind its northern European counterparts, in particular German-speaking countries. “France can catch up with the pack quite quickly as long as it adopts new technologies from the outset,” judges Stéphane Conjard, director of Knapp France, a supplier of handling solutions. 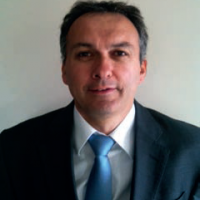 Thierry Belissa, Director of Egemin Automation France, a manufacturer of automated solutions and AGVs for handling and lifting. From a manufacturer’s perspective, the equation consists of developing innovative means of increasing work rates and reducing handling errors (and damage in the aisles) whilst also making work less tiring or arduous. The universally-adopted response comes in the form of developing modular solutions made up of individual components that work as independently as possible, requiring little or no external infrastructure to work and capable of assisting operators in their daily tasks. The quest for greater flexibility is for its part a heavy trend relating to the boom in e-commerce in all its forms which, despite reduced resources, seeks to acquire automated equipment to improve productivity. 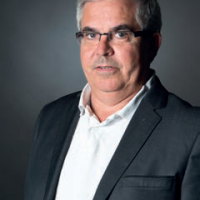 “Small and mediums sized firms short of space can start out with just a few isolated systems,” points our Thierry Belissa, France director of Egemin Automation, another manufacturer of automated solutions. “When their financial results permit, they can then progress to wider solutions.” This strategy offers manufacturers a variety of order sizes, ranging from several hundred thousand euros up to several million euros. Two main categories can be distinguished in stand-alone systems. On the one hand, fixed equipment such as automatic conveyors or new-generation sorting systems. Incorporating image recognition algorithms, the latter are capable of reading barcodes regardless of the position of the parcel, and can also detect packaging anomalies. The other main category is that of mobile equipment, such as self-guided and multi-directional vehicles which, contrary to their line-guided counterparts (which follow a line drawn on the ground) can move around independently in the warehouse. These automated guided vehicles (AGV) can scan their immediate environment and find their way on their own, as such distinguishing themselves for their self-learning capabilities. 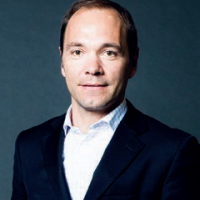 Daniel Chalancon, France director at Kardex-Remstar, manufacturer of automated storage systems. A perfect example of self-driving vehicles, it is commonplace to come across “shuttles” wandering around warehouse aisles. They are capable of reacting in order to avoid obstacles and of formulating diversion strategies that they store in their memories for future use. A far cry from the robots of yesteryear, sealed off inside a steel cage and further isolated by a safety cordon, today’s robots work much closer to operators. They analyse the image of a tray, spot targets, choose the correct gripper, turn it in order to automatically pick it up, and, possibly, pass it to a person. With the gift of artificial intelligence, these machines can monitor themselves and anticipate future failures through predictive maintenance programmes. These are often quite “talkative” and feed technical anomalies back to the firm’s information system: a warehouse management system, or WMS, which controls all of the internal operations required to manage throughput. And here, too, France holds a trump card in its hand. 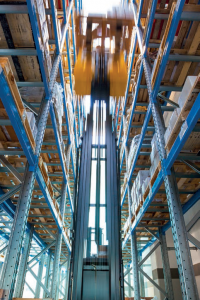 “French WMS are among the best on the market,” says Daniel Chalancon, France director at Kardex-Remstar, a manufacturer of automatic storage systems. Shuttles at work in warehouse aisles. Among the other technologies coming out in the handling market, cobots, or “collaborative robots”, deserve a mention. At the convergence of cognitive science, biomechanics and robotics, these machines akin to exoskeletons take the form of multi-articulated arms provided to operators to help them increase their capacities. Cobotics is not yet widespread in intralogistics but should soon break through in a sector often singled out for criticism in the field of musculoskeletal disorders (MSD). Previously, to improve employees’ working conditions, emphasis was placed on operator-friendly workstations. Also applied are the principles such as “goods-to-person” which consists of conveying products to the employee to reduce their physical movement and thus their fatigue. Without becoming obsolete, these rules have been surpassed by a change in paradigm whereby, in prosaic terms, operators become supervisors of automatic handling. “There will always be a need for robots to be monitored to deal with any possible malfunctions. 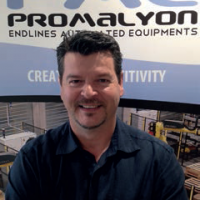 In addition, most of the time robots will need stocking up with consumables,” underlines Anthony Couriol, sales engineer at Promalyon, a manufacturer of robotic palletizing equipment. It looks like humans are not ready to be fully replaced by machines just yet. A-SAFE / ACTEMIUM / ALUM-A-LIFT / ALVEY SAMOVIE / ANTIPODA / APOLLO VTS B.V. / ARDEN-PLAST / ATECMAA PACKAGING / B+ EQUIPMENT / BA SYSTÈMES / BECK PACKAUTOMATEN / BECKER VERPACKUNG / BENNE SA / BEUMER GROUP / BRITISH CONVERTING SOLUTIONS / CCPIT - MSC / CENPAC / CIUCH SOLUTIONS / CLEVERTECH / COFFEE SERVICE / CONTAINER EQUIPEMENT ET ARRIMAGE / CSI PALLETISING / DALMEC / DENIPRO AG / DS AUTOMOTION / DUMAI EVENTS / DUPLEIX / EASYPACK / EGEMIN AUTOMATION / ELECTROCLASS / ELESA FRANCE / ENGELVIN BOIS MOULE / ERGOPACK FRANCE / FABER - CORIS - PERICHARD - AUPI / FENWICK / BALYO / FRANCE FEUILLARD CERCLAGE / GETRA / GPH - LEVALAIR / GRENZEBACH / GUILBERT EXPRESS / HALOILA / HANEL SYSTÈMES / HANGCHA FRANCE / HANGZHOU ZHONGYA MACHINERY CO.,LTD. / HMG EMBALLAGE / IFM ELECTRONIC / IGUS / IMS / INGENITEC / INTERROLL / ITALFIL / ITP / JONGE POERINK CONVEYORS / KALLFASS FRANCE / KARDEX FRANCE / KBS INDUSTRIEELEKTRONIK GMBH / KNAPP AG / KONGSKILDE / KUKA / LEGRO / LIFTEC MANIPULATION ERGONOMIQUE / LIFTOP / LINDER - THE STRAPPING MANUFACTURER / LOGISTICA PAGGIOLA / MAFIM / MANORGA / MANUT-LM / MANUVIT / MARCEAU / MIMAFILMS / NEOPOST SHIPPING / NERAK FEUCHT / NERGECO / NORD DRIVESYSTEMS / PAKERS MUSSY / PANOPACK / PANOTEC SRL / PROMALYON / QIMAROX B.V. / REGION CENTRE-VAL DE LOIRE / CENTRECO / RIPACK / RSPI / RULMECA FRANCE / SACRIA INDUSTRIES / SAFIL / SAPELEM / SCHMALZ / SCHNEIDER / SFERE BM / SFRM / SIGNODE INDUSTRIAL GROUP / SITMA FRANCE / SOCO SYSTEM SA / SOLUTIONS MANUTENTION / STOROPACK FRANCE / STRAPEX SAS / SYLEPS / TAIWAN ASSOCIATION OF MACHINERY INDUSTRY / TECADIS SYSTEMS / TECHNI-CONTACT / TENTE / TEUFELBERGER / THIMON / TOSA / TRIAX / ULMA HANDLING SYSTEM / UVO TECHNOLOGIES / VREEBERG BV / WESTFALIA / WICKE FRANCE S.A.S / WUBUMP.